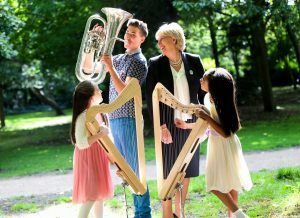 Heather Humphreys TD, Minister for Arts, Heritage and the Gaeltacht with Juliyah Deane, Joseph Mc Cabe and Aaliyah Mc Ghee at the announcement of the Music Capital Scheme 2015. Creative Ireland is all about you. It’s about how, whether you are young or old, you can benefit from getting more involved in arts, culture and creativity. It’s an ambitious five-year Government strategy that aims to boost wellbeing in schools, homes and communities nationwide. You might remember the huge success of the commemorative programme last year, when thousands of cultural events were held nationwide to remember 1916. We knew that something special was happening through the commemorations; it awoke a great appetite for people to engage with their unique culture at a local and national level. We wanted to build a legacy from that tremendous cultural awakening, and that legacy is Creative Ireland. One of the key aims of Creative Ireland is to ensure that every child in the country will have access to lessons and tuition in art, drama, music or coding over the next five years. Research shows that children who engage in the arts and cultural activity are happier, suffer less anxiety and do better at school. Put simply, engaging in the arts is good for our kids, and I think that is an incredibly powerful message. This element of Creative Ireland has the potential to have a positive impact on generations to come. We’ll be announcing more details on how we will achieve that after the schools come back in September, but in the meantime we are encouraging everyone to get out and about this summer to discover what is on offer culturally in your own town, village or county. There is so much going on, including Riverfest. Creative Teams have been appointed in every county nationwide, to help drive culture and creativity nationwide. Through Creative Ireland we don’t just want to improve access to arts and culture; we want to see more people getting involved. So why not consider checking out your local drama group or dropping into your local theatre? Our heritage is also an essential part of our culture and Heritage Week, which takes place in August, is a great way of getting involved and learning more about the heritage of your locality. You’ll be hearing more and more about Creative Ireland in the coming weeks and months. For example, later in the year we’ll be announcing plans on how we will grow our film and TV industry here, something which can be of benefit to some of our most remote and beautiful locations. By increasing participation in cultural activities and supporting our creative industries, we can boost our wellbeing and drive further economic growth. I hope you’ll join us on this creative journey. Creative Ireland will benefit the West"